Israeli siege is damaging the mental health of Palestinians, with rights groups documenting a rise in suicide attempts. Gaza Strip – As Rezeq Abu Setta, 39, climbed the antenna tower of a 68-metre-high building last year, he was sure that jumping off was the solution to his problems. But once at the top, he realised that his family would be the only ones to suffer in the end. After lingering for seven hours on the antenna tower, contemplating whether to jump, he decided to climb back down. In January 2011, Abu Setta suddenly found out that his salary as a Palestinian Authority security guard had been cut for reasons that were unclear. For five years, he tried to get his salary back, but received only empty promises in return. This was just one of the challenges Abu Setta had been grappling with: He had struggled with work-related injuries on several occasions, his home was destroyed twice during Israeli offensives on Gaza, his father was killed, and his mother was imprisoned in an Israeli jail for eight years. Suicides have always been a rare occurrence in Palestinian society, amounting to about one suicide a year at most, but health officials say it has become an increasingly prevalent phenomenon in Gaza today. At least 95 people tried to commit suicide in the Gaza Strip in the first quarter of 2016, a nearly 40 percent increase from previous years, according to the Euro-Mediterranean Human Rights Monitor. In recent years, there have been many cases or attempts of self-immolation by youth in both Gaza and the occupied West Bank. According to Akram Nafi, a psychiatrist at the Gaza Community Mental Health Programme, the way people are committing suicide has also changed. “Usually, people who wish to commit suicide choose to do so around midnight, and they make a secret plan because they just want to end their lives in peace. But these people are making a show and they use a very painful way to do so; most of them are under severe pressure,” Nafi told Al Jazeera. It is a way for them to say “no” to the crushing unemployment and ongoing blockade of Gaza, which makes them stressed, anxious and feeling hopeless, Nafi explained. “The suicides aren’t due to psychological disorders; these kinds of people [who have been attempting suicide] believe that there’s no hope for anyone to help them. The occupation and the whole world is putting pressure on us and they want to punish us just because we are living on our land and they are cutting all the basic needs,” Nafi said. With Gaza’s unemployment rate at 42 percent, among the highest in the world, in addition to a decade-long Israeli-Egyptian blockade and ongoing recovery efforts from three military offensives, much of the population is battling depression, anxiety or post-traumatic stress disorder (PTSD). Around 96 percent of Gaza’s water is unfit for human consumption and, this summer, electricity dwindled to about two hours a day. Under international humanitarian law, Israel, as an occupying power, is responsible for the health and welfare of the Palestinian population. “The Israeli occupation is firstly responsible for all these things,” Nafi said. “Even if sometimes the government in Gaza is responsible for something, it’s the occupation that puts pressure on this government. Researchers at the UK-based Medical Aid for Palestinians (MAP) echoed this sentiment in a recent report, which details how Israel’s 50-year occupation of the West Bank and Gaza has taken a heavy toll on Palestinians’ mental health. During the first five years of the closure of Gaza from 2007 to 2012, depression rose by 18 percent, according to the Gaza Community Mental Health Programme. After the 2014 offensive, the World Health Organization estimated that up to 20 percent of Gaza’s population may have developed mental health conditions. Among children living in bombarded areas, the rate of PTSD was at 54 percent. MAP’s report argues that with the ongoing blockade and violence, there is no “post” in post-traumatic stress disorder for Palestinians in Gaza; the trauma is ongoing. Children living near the buffer zones with Israel are more exposed to violence and Israeli incursions. As a result, they develop anxiety, deep fear and have problems with nightmares and bed-wetting. In normal environments, the best solution would be to remove the source of the problem, “but in Gaza, you can’t change the situation. The solution would be to offer them a secure area for these children, but we can’t offer that,” Nafi said. Instead, patients are supported with medication and efforts to help them adapt to the status quo. 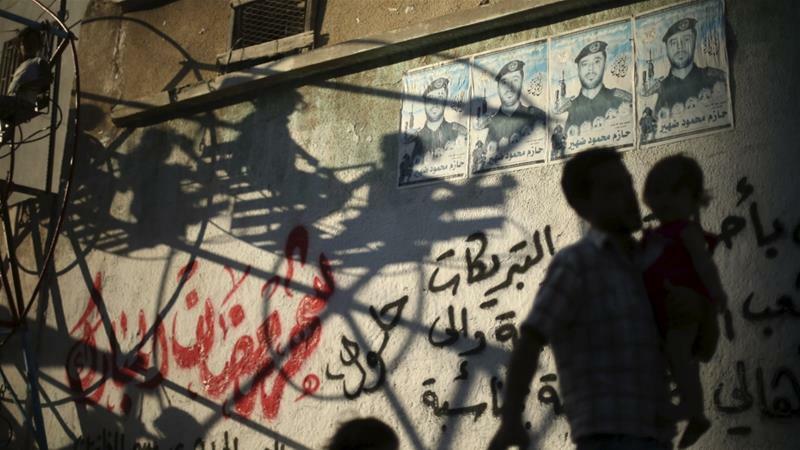 Reminders of war are ubiquitous in Gaza and many fear a new offensive is coming soon. The buzzing sound of Israeli drones or the roar of F-16 fighter jets are heard on a regular basis, while Israeli officials make threats of another impending war in the media. 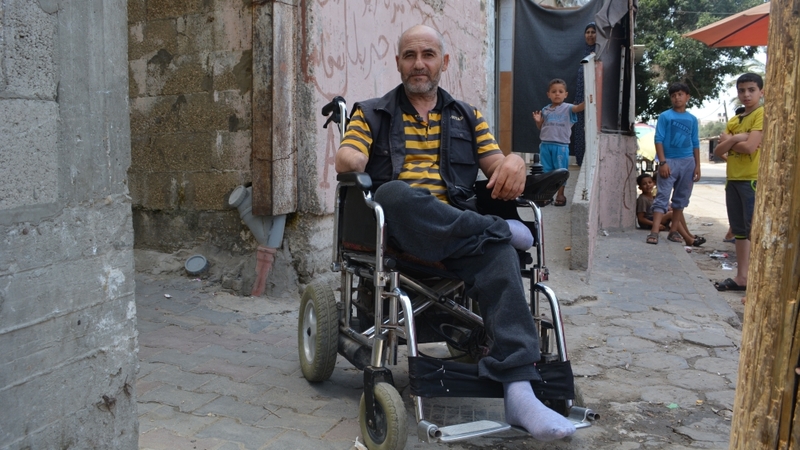 With the help of the Palestine Trauma Centre, Noman Jibreel, 53, from Bureij refugee camp, is still recovering from the last Israeli offensive in 2014. He goes into shock whenever he hears any sort of explosion, even a simple firecracker thrown by children in the streets. Jibreel was working in his mini-market in his home in July 2014 when a drone rocket destroyed his neighbour’s house. He stepped out to see if anyone was still alive, but did not make it two metres before another rocket struck his home. He lost his leg, arm, half of his foot and hearing in his left ear. 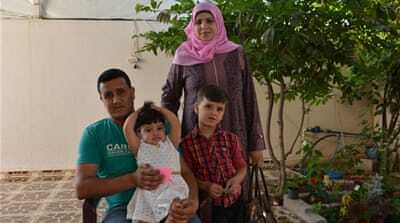 At the hospital in Gaza, doctors were about to amputate his other arm, but his sons refused. Instead, they took him to Egypt, where doctors saved his arm by inserting a metal ruler. Today, he can move his remaining arm but cannot carry anything. Fragments of the rocket are still lodged in his skull; if they are removed, he will become quadriplegic. Confined to his electric wheelchair, Jibreel cannot venture far from home, since his faulty battery often does not have enough power due to the electricity crisis. Despite all these obstacles, he refuses to fall into depression.